These ideas from Buzzfeed are for apartments, but can be used for any tiny space. Enjoy! 1. Instead of a bedside table, opt for ladder-like shelving. 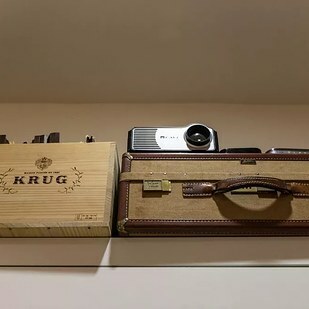 Again with the storage! But if you have lots of books or treasures, this is a wonderful way to display slash store them. 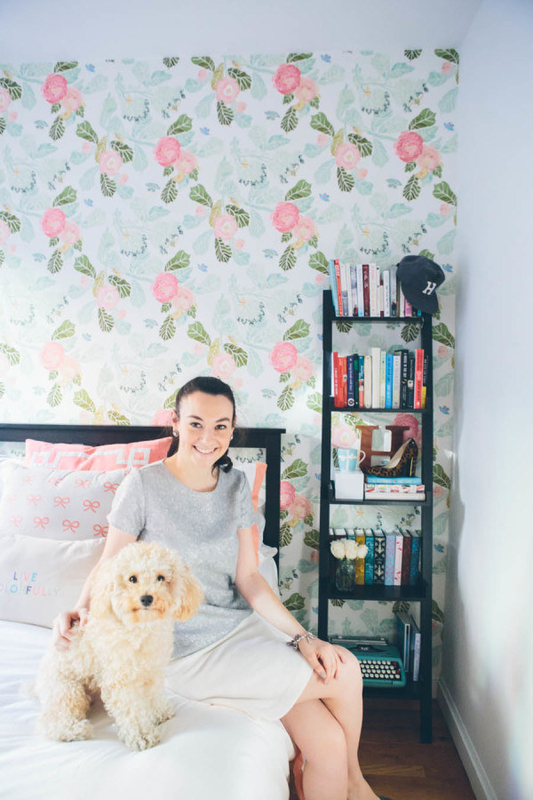 See more of this small New York home here. Find a similar shelf for $74.99 here. 2. Hang wall sconces above your bed when you have no space for a lamp on your beside table. And, if two sconces seem like too much in your tiny bedroom, opt for just one, like in this Manhattan maximalist home from Lonny. 3. Co-opt your couch as a footboard for your bed and divider between your sleeping and living areas. In this Washington, D.C. studio, both the rug and the couch serve as visual indicators of where one living space begins and the other ends. 4. And try to keep your couch on the smaller side. I know, ugh, it’s so hard not to go big or go home on this one, since you spend so much time Netflix-ing here. But maybe this Washington, D.C., makeover will inspire you. And if you’re curious about small sofas, Wayfair has a great selection, as does West Elm and of course Ikea (two Kivik one-seat sections are shown above, $309 each). 5. 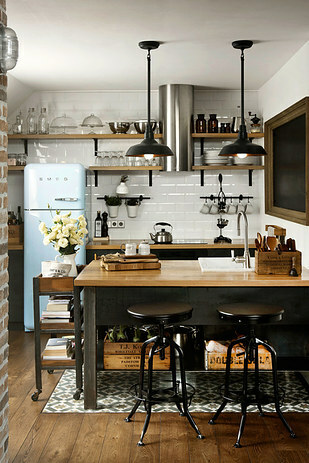 Embrace controlled clutter by covering a wall floor-to-ceiling with shelving and coordinated bins. The consistent red bins across the top help make this small space look more intentional. Plus, it’s like a mini version of a dream library. 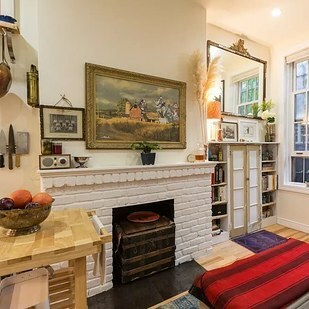 See more photos of this Brooklyn apartment here. 6. 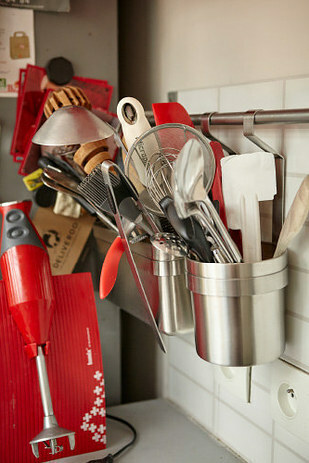 Use a chef’s cart to double the counter and storage space in your itty-bitty kitchen. See more of this Manhattan apartment here, and find a similar cart for $403.11 (yes, this is a fancy one) here. 7. 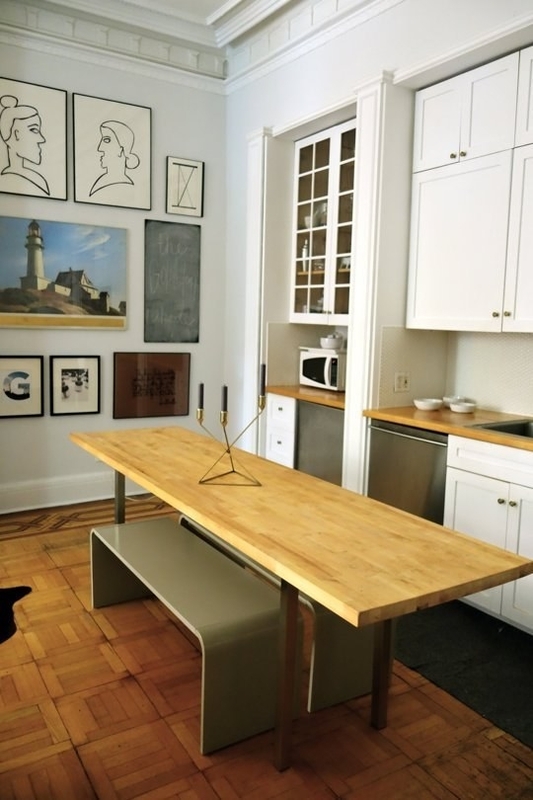 If your space is slightly less tiny, use a long and narrow butcher block that doubles as counter space and dinner party table. See more of this Brooklyn space here. 8. Install a kitchen rail system and use it for whatever extra storage you need the most. This apartment is in Sofia, Bulgaria, and some of the rooms aren’t that tiny. But the kitchen certainly is. Ikea has some affordable rail systems, like the Grundtal ($7.99 for a starter rail) and Fintorp ($8.99–$9.99 for a starter rail). 9. 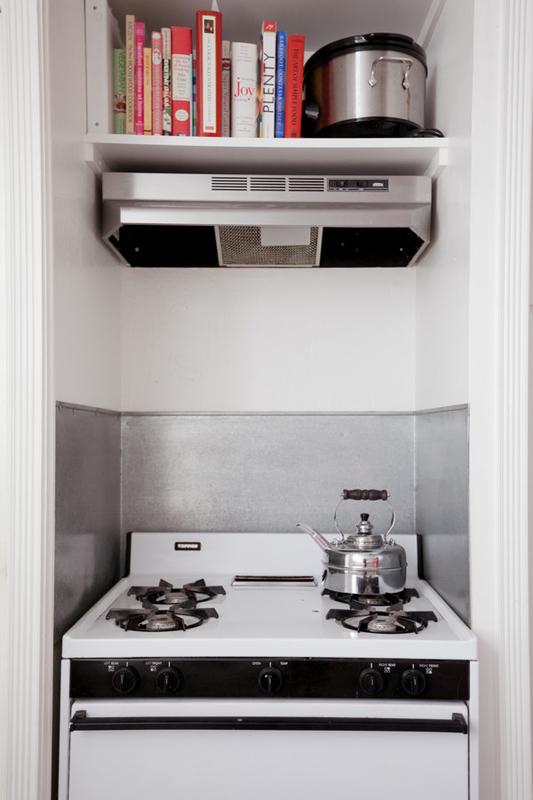 Hang your pots and pans overhead on a sturdy rack to free up cabinet space for other necessary things. Like actual food, because you probably don’t have a pantry. See more photos of blogger Joy the Baker’s kitchen here. Get a similar square pot rack for $59.99 here. 10. 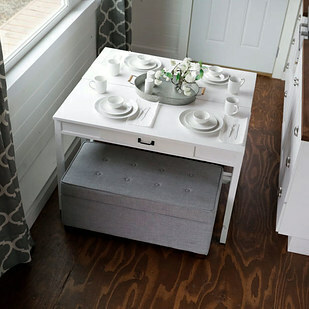 Take two narrow tables and two benches (or four stools) and use them as convertible desks slash a dinner table. 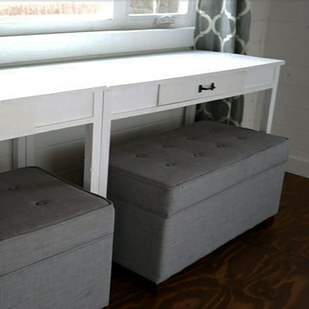 Get the plans to build these tables here, or use two console tables (also known as sofa tables), like this one, $59. See more photos and tips from this particular tiny house here. 11. Fill any awkward spaces with extra storage space. Just make sure it’s nice and secure, so your cookbooks don’t collapse on the open flames. Check out this 500-square-foot San Francisco apartment here. 12. See every spot as a stylish storage opportunity — even the top of your toilet tank. This backyard cottage in Dallas uses it for a plant and a couple of decorative bottles, but you could use it for more practical things, like mouthwash and lotion. If you’re worried about the tray sliding off the top of your tank, secure it with a couple of removable adhesive strips like these, $2.88. You can get a clear tray here for $5.99, or opt for something more decorative here for $12.99. 13. Skip a visually intrusive television in favor of a small projector your can connect to your computer. In this 242-square-foot corner of Manhattan, the image is projected on the blank wall above the painting, but you could also find a motorized projection screen like this one, $139. 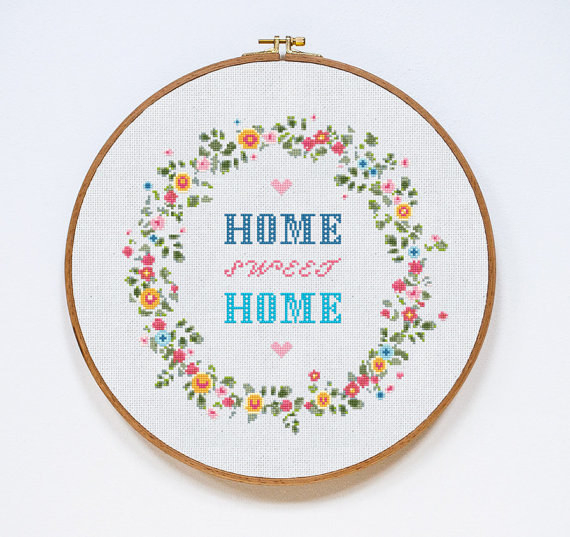 And remember, your apartment doesn’t have to be perfect to be a home!